"TARAM THE BLACK CAULDRON - 1985" 4x6 FT BUS SHELTER FRENCH GRANDE FOLD - USED Folded posters are all coming from an old cinema and due to limited working-time, they haven't been tcheck in details. They're all in good general condition but there's maybe some pin' hole or time micro-use on sides. Please tcheck the pictures in details. This is a guaranteed ORIGINAL FRENCH POSTER from the period of print/creation, this is NOT a reproduction or copy. Solid extra-strong Unbreakable/unfoldable Plastic UPVC tube as shown on pictures. There's probably something more for you if you clic here. You love art and photography? You look for the next artist to bet on? It's write just on my profile : French, Artist and Photographer..
CLIC HERE TO FOLLOW MY ART ON FACEBOOK : CLIC HERE TO VISIT MY WEBSITE : CLIC HERE TO FOLLOW MY ART ON TWITTER. 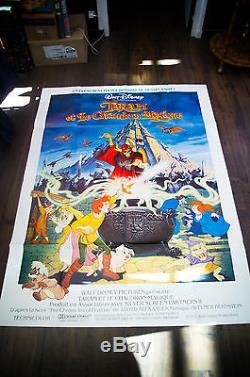 The item "TARAM THE BLACK CAULDRON Walt Disney 4x6 ft Shelter Movie Poster Original 1985" is in sale since Wednesday, April 5, 2017. This item is in the category "Entertainment Memorabilia\Movie Memorabilia\Posters\Originals-United States\1980-89". The seller is "freddymietofficiel" and is located in Montpellier. This item can be shipped worldwide.